Delays are expected this week as road work including drainage and milling is scheduled to continue on Route 4 this week. The project is scheduled to last through this spring and summer and covers a distance of roughly 14 miles between the Rutland-Mendon town line and Mission Farm Road in Killington. Crews are scheduled to continue with drainage work along the road in the area of the Cortina Inn and in Killington throughout the week. This work may require shoulder and/or lane closures throughout the week. Motorists are advised to use caution when traveling through the work zone. Crews are scheduled to begin milling the road surface beginning at the Rutland City-Rutland town line and continuing easterly into Mendon throughout the week. Crews will begin paving in base course on milled surfaces late in the week, weather permitting. Ledge removal, shoulder, drainage, milling and paving operations will require lane closures and lane shifts will be in effect. One eastbound lane and one westbound lane will remain open to traffic throughout the lane shift. Flaggers and uniformed traffic officers will be on site directing the flow of traffic. One-way alternating traffic may be necessary for brief periods in order to maneuver construction vehicles and equipment. Five hundred feet of exposed roadside ledge near the Wheelerville Road in Mendon have been scaled back to remove unstable rock. The two black boxes cover two existing cisterns, which historically captured water trickling down the ledges. The shoulder has been graded and seeded, but more work may be done to address the runoff. 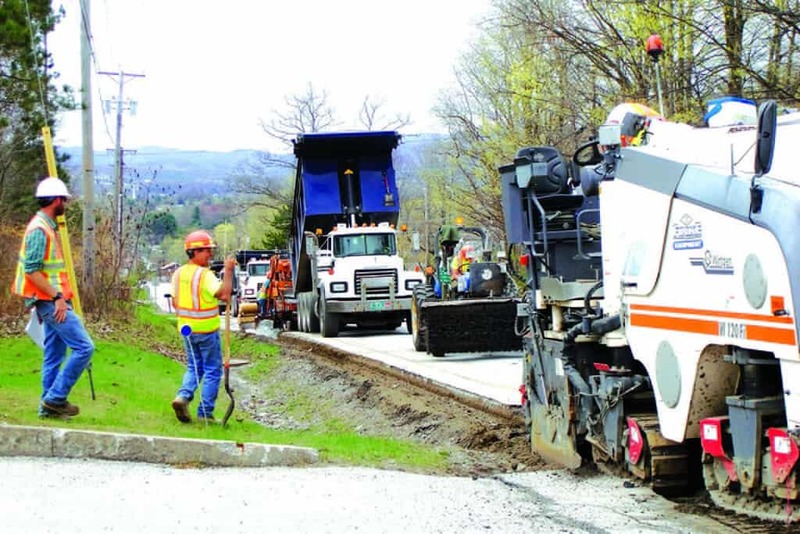 In Mendon, the eastbound shoulder is being widened to a minimum of four feet for bicycle use, preparatory to a complete repaving job from Rutland to the Skyeship gondola in Killington, to tie in with the Killington-to-Woodstock portion done last year. In addition, the “bump” at Winterberry will be removed, requiring a new sub-base and drainage to deal with a permanent frost heave. Borings were done last winter that discovered ground water. The widened shoulders will not create an official bike lane but can accommodate bicycles, in line with AOT goals. “We do what we can,” Jonathan Harrington, AOT project manager, told Mountain Times. “This project will create wider shoulders than we see today,” he said, and may pare away some lane width in places. Crews widen the road shoulders in Rutland Town near Post Road.